Our most popular type of apron, choose from 20 great colors! Full and Half Bistro aprons with all types of styles and colors! Many different sizes, styles and colors to choose from! 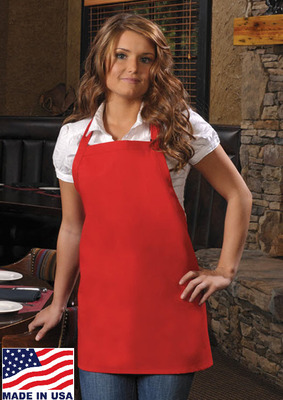 Many styles and colors of Bib Aprons with no pockets. 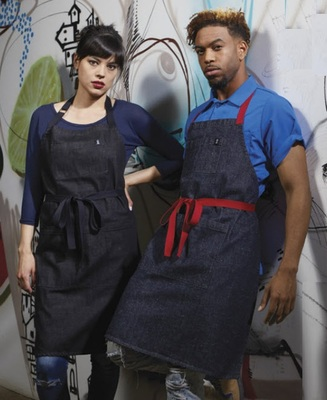 We have adult and children's cobbler aprons in a selection of 15 great colors! Aprons are a fundamentally essential part of the restaurant and hospitality industry. At Averill's Sharper Uniforms, we have a great selection of aprons for chefs, wait staff and other members of your team. We make it super easy to outfit all of your employees with the kitchen apron or the serving apron needed to perform their jobs at the highest performance and most professional level possible! 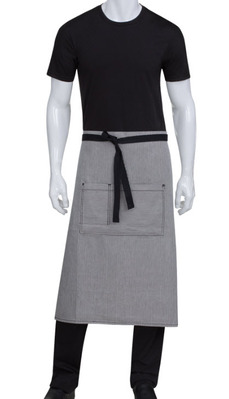 From bib chefs aprons with pockets to waist aprons that keep your wait staff feeling comfortable, Sharper Uniforms is the only place to shop when you need restaurant uniforms and aprons for everyone on your payroll. Made from 65/35 poly/cotton, our chef aprons, wait staff aprons and kitchen aprons are very durable, long lasting and stand up to rigorous frequent laundering. Plus, many of our restaurant aprons and chefs aprons come with features that make their daily wear and frequent use much more comfortable and practical. From extra-long ties to handy pockets, our restaurant aprons and wait staff aprons come in a wide variety of styles to suit your unique needs. Did we mention that you can also give us a call for special requests? If you don't see exactly what you're looking for, please don't hesitate to give us a call! We are available to work with our customers with any request that they may have. 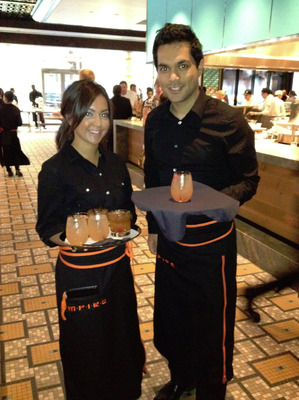 Shop our three types of wait staff restaurant aprons: waist aprons, bib aprons and cobbler aprons. 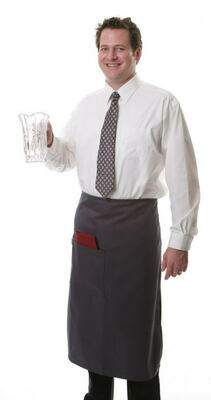 All wait staff aprons and restaurant aprons can come with pockets or no pockets, depending on your preference. Our most popular waist apron is our style 100 three pocket waist apron. Another favorite is the reversible three pocket waist apron. Our customers love the three-pocket waist apron because when it gets dirty on one side, the wait staff server can turn the apron around to the clean side. Other popular waist aprons are the half apron and full bistro aprons with pockets for added convenience. 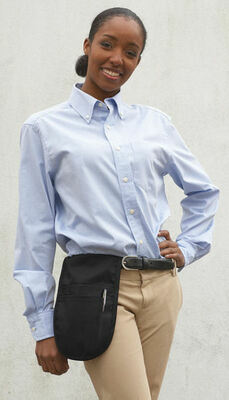 At Averill's Sharper Uniforms, our most popular bib apron is the style 200 three pocket bib apron. Both the waist and bib aprons may be ordered in different sizes. Optional pen pockets are also available, which are incorporated into the main pockets. Another favorite bib apron is the style 200XX Criss-Cross apron, which offers support from straps that circle around your back. This apron style is typically used in industrial situations where the staff is on their feet most of the day. Further, cobbler aprons are also typically used in industrial situations, such as work shop areas and for janitorial staff. When it comes to custom decorations and the personalization of our aprons, we offer full embroidery, screen print and heat seal services. All styles of aprons may be decorated to create an ultra-personalized item that will remind your restaurant customers exactly where they are. 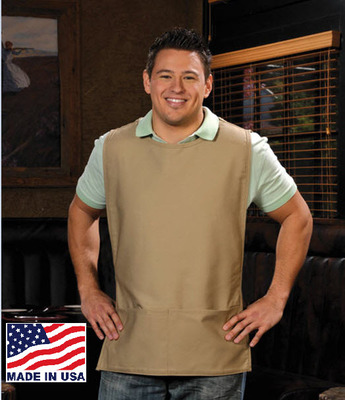 When it comes to bib aprons, most customers wish to put a large logo on the front center chest. We typically recommend silk screening for this purpose; this is because it is more economical than the other two services. We also offer a quick turnaround on your custom apron services: once a design is approved, the decoration process is usually two weeks or less. Please visit our Custom Restaurant Uniform Decoration section for more details. If you prefer a custom restaurant apron in size and pockets, we are happy to make custom aprons in any size and color. Please note that the minimum order for this is 40 aprons. Shop our kitchen aprons, chefs' aprons and restaurant aprons selections today to find the perfect fit in a rainbow of colors as well as a huge variety of sizes to accommodate all shapes and body types. Need something special? Give us a call toll free 1-877-284-1761.